One of the questions that are commonly asked during a tour with families is: What does the food taste like here? No matter your age, everyone wants to eat good food. It is a fundamental joy in our lives. Your parent should enjoy the food they are served in their new home. Families should try a meal when touring potential communities to taste the level of quality for themselves. Food can be a large part of the decision-making process and families should have certain expectations about the dining program. Many families are not aware that their parent’s sense of smell and taste may have faded. This is a normal part of the aging process. If your parent can no longer smell the comforting scent of baked bread, the jolt of smelling a fresh cup of coffee, or the mouthwatering aroma of warm cookies from the oven, this lack of sense of smell can decrease their appetite dramatically. In an attempt to make food taste better, many seniors will heap spoonfuls of sugar on their food or use an excess of salt which can lead to diabetes or high blood pressure. A loss of appetite for frail seniors can have detrimental effects on their health. It can result in weight loss, poor nutrition, an impaired immune system, or weakness. But possibly the worst part of losing their sense of smell or sense of taste is the negative impact on their quality of life. The culinary program in an assisted living community should not only focus on the nutritional value and health benefits, but also food’s ability to comfort and bring joy. They should employ talented chefs who make every meal not only tasty but visually appealing to tempt residents and encourage their appetite. Another benefit of living in an assisted living community is all shopping, prep, and cooking is done for your parent. No longer do they need to grocery shop, drive to the store, walk up and down the aisles, clip coupons, load and unload groceries, prep meals, and clean up after. This can be a monumental task. In many cases, seniors will opt for easy, quick, and less healthy options when on their own. This is one stress that your parent will no longer need to manage. Assisted living communities should provide three balanced nutritional meals each day, snacks throughout the day, and beverages to keep them well hydrated. Residents should get the nutrition they need to stay strong. For many seniors who live alone at home, they can feel very isolated during mealtimes. This isolation can lead to feelings of loneliness and depression which is common among the elderly. One of the many benefits of living in an assisted living community is that residents will have a neighbor or friend to dine with and share their meals. Meals are social events where residents enjoy time together while getting nutritious foods to boost their immunity to keep them healthy and active. Studies have shown that seniors eat more food and make healthier food decisions when in the company of friends. Your loved ones community should offer healthy snacks and thirst-quenching beverages throughout the day to ensure they are getting enough calories and staying hydrated. And meals, snacks, and drinks should be included in the monthly rate. Our Corporate Director of Food and Beverage, Todd Moreau, ensures the highest level of culinary service and consistency of fresh produce and seasonal products across all Aegis Living communities. In this position, he understands that food and mealtimes mean not only nutrition but can be a comforting and satisfying part of each day. Meals are important for our residents, and we take great care in exceeding expectations in the kitchen. With 21 years of senior housing experience and serving thousands of meals to our residents, our culinary program has standardized favorite recipes that delight our many residents and their guests. Seasonal offerings utilize local vendors, using sustainable products, and supporting the greater community. And since variety is the spice of life, we offer rotating specialty menu items regularly to provide fresh, exciting options to try. 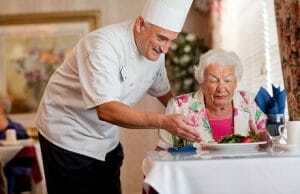 But our recipes are not typical fare that you might expect in an assisted living dining room but rather elevated. Our culinary program aims to bring meal options to the level of fine dining that you might experience at a resort. For some seniors, eating can be difficult. Swallowing may be hard. We have created an offering of small bites for residents who need a simplified way of eating. And to offer a way to dine with dignity, we have a rotating menu of purees. We accommodate people with a variety of dietary limitations and food allergies, to ensure they can still enjoy fine dining with quality food. Visit your local Aegis Living community for a tour and lunch.